"Mar-a-Lago Visitor Logs To Become Public, If They Exist," by Brian Naylor, NPR, July 17, 2017. 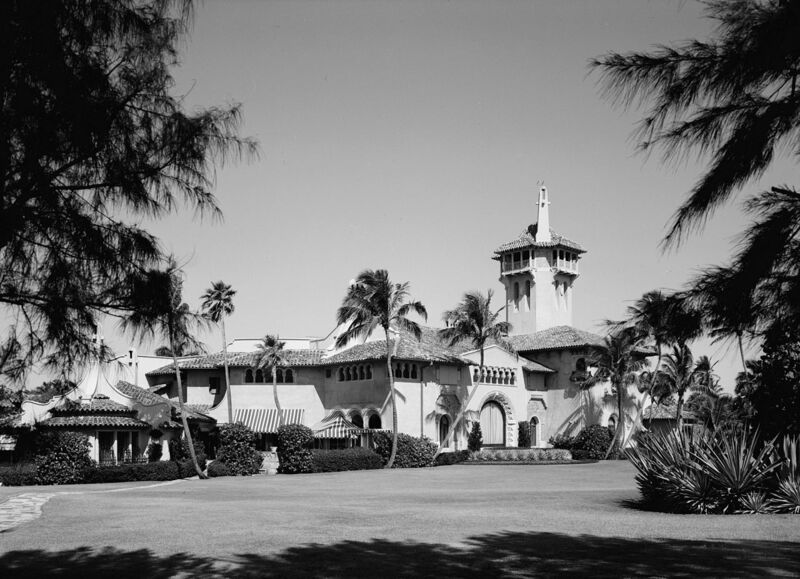 "Watchdog group says Trump will have to turn over Mar-a-Lago visitor records," by Nolan D. McCaskill and Darren Samuelsohn, Politico, July 17, 2017. Washington, D.C., July 17, 2017 – The Department of Homeland Security will release the visitor logs for President Trump's Mar-a-Lago resort by September 8, according to a court order filed on July 14, 2017, by federal judge Katherine Polk Failla. The order is in response to a Freedom of Information Act (FOIA) lawsuit brought by the National Security Archive, together with the Knight First Amendment Institute at Columbia University and the Citizens for Responsibility and Ethics in Washington (CREW). The suit, Doyle v. DHS, was filed on April 10, 2017, in the federal District Court for the Southern District of New York. It seeks the Secret Service's White House visitor logs dating from Inauguration Day through March 8 ,including visitor logs for Mar-a-Lago and Trump Tower. 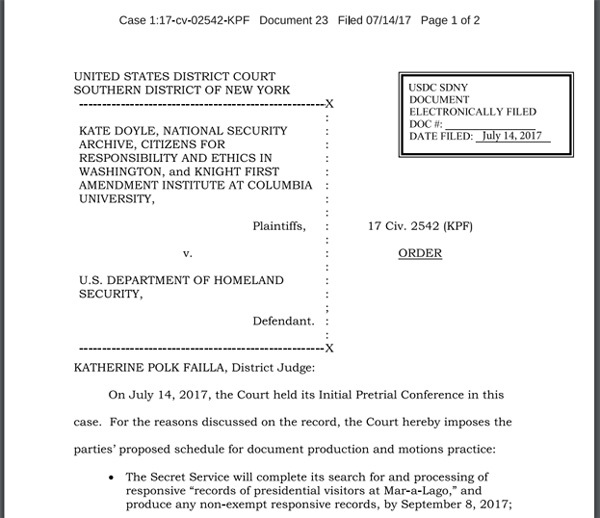 The National Security Archive’s Kate Doyle, senior analyst working on US-Latin America policy, filed the initial FOIA request with the Secret Service on January 23 for the Worker and Visitor Entrance System (WAVES) records and Access Control Records System (ACR) records covering Inauguration weekend. WAVES and ACR are the systems that keep track of White House visitors and were used to generate the White House visitor logs previously posted to Whitehouse.gov. The government has until the end of September 2017 to file declarations concerning the White House visitor logs; DHS claims there are no such records for Trump Tower since the President did not visit the property during the time period covered by the request. The Obama administration began voluntarily posting the visitor logs on Whitehouse.gov after a September 2009 settlement with CREW, which brought the original White House visitor log lawsuit against the George W. Bush administration in 2007. The Obama administration agreed to post the logs 90 to 120 days after the visits took place, with several exceptions, and did so throughout the duration of Obama’s two terms, cumulatively posting 5.99 million rows of data that were viewed 471 thousand times and downloaded more than 10 thousand times as of the page’s final update on December 30, 2016. The published visitor logs contained 28 fields of data, including the date and time of the appointment, type of access the visitor received, and a description of the visitors. 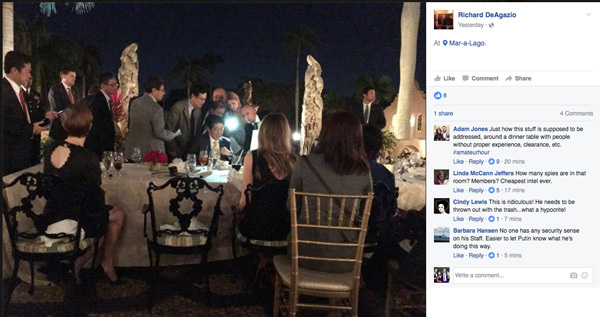 Mar-a-Lago guest Richard DeAgazio's Facebook page featured a number of pictures of President Trump's meeting with Japanese Prime Minister Shinzo Abe as news broke North Korea had fired a missile in the direction of Japan. Image courtesy of federal HABS—Historic American Buildings Survey in Florida project.